The first scoop of soil analyzed by the analytical suite in the belly of NASA's Curiosity rover reveals that fine materials on the surface of the planet contain several percent water by weight. The results were published today in Science as one article in a five-paper special section on the Curiosity mission. "One of the most exciting results from this very first solid sample ingested by Curiosity is the high percentage of water in the soil," said Laurie Leshin, lead author of one paper and dean of the School Science at Rensselaer Polytechnic Institute. "About 2 percent of the soil on the surface of Mars is made up of water, which is a great resource, and interesting scientifically." The sample also released significant carbon dioxide, oxygen and sulfur compounds when heated. Curiosity landed in Gale Crater on the surface of Mars on Aug. 6, 2012, charged with answering the question: "Could Mars have once harbored life?" To do that, Curiosity is the first rover on Mars to carry equipment for gathering and processing samples of rock and soil. 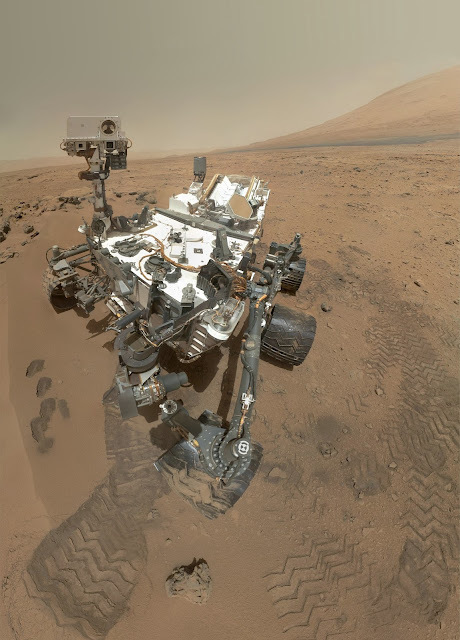 One of those instruments was employed in the current research: the Sample Analysis at Mars (SAM) instrument suite, which includes a gas chromatograph, a mass spectrometer and a tunable laser spectrometer. These tools enable SAM to identify a wide range of chemical compounds and determine the ratios of different isotopes of key elements. "This work not only demonstrates that SAM is working beautifully on Mars, but also shows how SAM fits into Curiosity's powerful and comprehensive suite of scientific instruments," said Paul Mahaffy, principal investigator for SAM at NASA's Goddard Space Flight Center in Greenbelt, Md. "By combining analyses of water and other volatiles from SAM with mineralogical, chemical and geological data from Curiosity's other instruments, we have the most comprehensive information ever obtained on Martian surface fines. These data greatly advance our understanding surface processes and the action of water on Mars." Thirty-four researchers, all members of the Mars Science Laboratory Science Team, contributed to the paper. In this study, scientists used the rover's scoop to collect dust, dirt and finely grained soil from a sandy patch known as Rocknest. Researchers fed portions of the fifth scoop into SAM. Inside SAM, the "fines"—the dust, dirt and fine soil—were heated to 1,535 degrees F (835 C). Baking the sample also revealed a compound containing chlorine and oxygen, likely chlorate or perchlorate, previously found near the north pole on Mars. Finding such compounds at Curiosity's equatorial site suggests they could be distributed more globally. The analysis also suggests the presence of carbonate materials, which form in the presence of water. In addition to determining the amount of the major gases released, SAM also analyzed ratios of isotopes of hydrogen and carbon in the released water and carbon dioxide. Isotopes are variants of the same chemical element with different numbers of neutrons, and therefore different atomic weights. SAM found that the ratio of some isotopes in the soil is similar to the ratio found in atmospheric samples analyzed earlier, indicating that the surface soil has interacted heavily with the atmosphere. "The isotopic ratios, including hydrogen-to-deuterium ratios and carbon isotopes, tend to support the idea that as the dust is moving around the planet, it's reacting with some of the gases from the atmosphere," Leshin said. SAM can also search for trace levels of organic compounds. Although several simple organic compounds were detected in the experiments at Rocknest, they aren't clearly Martian in origin. Instead, it is likely that they formed during the high-temperature experiments, when the heat decomposed perchlorates in the Rocknest samples, releasing oxygen and chlorine that then reacted with terrestrial organics already present in the SAM instrument. A related paper, published in the Journal of Geophysical Research-Planets, details the findings of perchlorates and other chlorine-bearing compounds in the Rocknest sample. This paper is led by Daniel Glavin, a Mars Science Laboratory Science Team member at Goddard. Glavin notes that SAM has the ability to perform another kind of experiment to address the question of whether organic molecules are present in the Martian samples. The SAM suite includes nine fluid-filled cups which hold chemicals that can react with organic molecules if present in the soil samples. "Because these reactions occur at low temperatures, the presence of perchlorates will not inhibit the detection of Martian organic compounds," said Glavin. The combined results shed light on the composition of the planet's surface, while offering direction for future research. "Mars has kind of a global layer, a layer of surface soil that has been mixed and distributed by frequent dust storms. So a scoop of this stuff is basically a microscopic Mars rock collection," said Leshin. "If you mix many grains of it together, you probably have an accurate picture of typical Martian crust. By learning about it in any one place you're learning about the entire planet." NASA's Jet Propulsion Laboratory, Pasadena, Calif.
Now THAT is some cool stuff! Taking a moment to remember those that lost their lives and the ones wounded, in Monday’s senseless shooting that killed 12 innocent, hard working people. In our prayers all… along with their family and friends. .Note: This video will only be up on YouTube until 9/15/2013… Then I’ll be taking it down until I bring it back again around this time next year. I made the above video/slide back in 2004 on the events of 9/11 the day… and as time slowly passed, up to one year later. I was running down some music to use on my family website that I use to have up… and at the time was looking in a place I used from time to time that had GREAT midi files that a very talented man name Dan West wrote and composed. That’s when I ran across his latest work that he had written and composed himself in memory of the victims of 9-11. His song was titled “Heartbreak Blues” and Dan had put it up on his website for all to listen too. Anyway… to make a long story short… Dan’s music inspired me so… that I wrote him and asked his permission to use his music in a video/slide project I was wanting to work on and he was kind enough to say OK. And that I still thank him for. Ok then… About the video. The very first part is put together pretty much in a perfect timeline as the events unfolded that tragic day on 9/11/2001. Then I go back and forth in time with the rest. The 2nd part, “Goodbyes”, after the credit roll, starts off at the footprints of the Twin Towers, one year later. It was early that morning on 9-11-2002 and the family members of the ones that lost their lives along with others came to say goodbye one more time. The morning went from a calm clear morning at first then to being very windy and a dust storm whipped up. Some of the family members who were there said it was as if their loved ones had come down from heaven to say their last goodbyes too. Many said a chill was in the air and that a strange calm came over them. After the first few pictures I move back and forth in time from days after 9-11-2001, as people from around the world mourned the dead and this tragedy to one year later, back at the footprints of the towers. Why did I make this video some might ask? Well… I mainly made this video for my family and friends to watch once a year... and being you are reading this right now… you MUST be one or the other!!! So again… this video/slide that I made is actually a 2-parter. The 1st part I call “9/11… How Soon We Forget”. Then after the credit roll is the 2nd part that I call “Goodbyes”. So be sure to watch it to the end. Now for the record… I could have gone very graphic with this and almost did at first… but in the end I keep away from doing so for I wanted it to be able to be seen by both adults and children alike. Regardless, I still made it strong enough to get the point across as to just how violent and emotional of an event this really was. AubreyJ.org. Owned by Aubrey J. Fawcett. Copyright 2012. Awesome Inc. theme. Powered by Blogger.